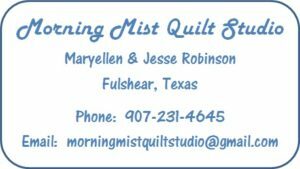 Morning Mist Quilt Studio, owned by Maryellen & Jesse Robinson, is located in Fulshear, Texas. Fulshear is about 20 miles west of Houston. We moved to Texas in January, 2018. Our quilting business was started in Palmer, Alaska in August, 2016 while we lived on Morning Mist Drive. The picture on the top of the screen was taken early one spring morning from a window in our Palmer studio. With such an inspirational view and lovely street name, what else could we name our business? 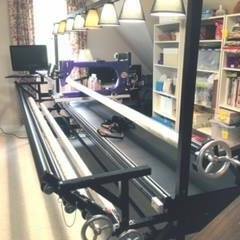 We have been blessed with this opportunity that fulfills a long-time dream to open our own quilting business anchored by an amazing Gammill Statler Stitcher computerized quilting system. We would love the opportunity to become your quilting partner and help you complete your beautiful works of art! In the Fulshear/Houston area arrangements can be made to pick up and deliver your projects to conveniently meet your needs. We can also provide services through the US Postal Service, shipping to and from anywhere! Please review our Services and guidelines for Preparing Your Quilt for Quilting and contact us if you have any questions. We are ready to help you complete your next quilt!